Located in downtown Johnson City, this hotel is a 5-minute drive to East Tennessee State University. It features spacious rooms with a 32-inch flat-screen TV and serves a daily breakfast buffet. Guests of the Hampton Inn Johnson City can enjoy free access to the seasonal outdoor pool and a small gym. The business center offers fax/copy services and free parking is available on-site. 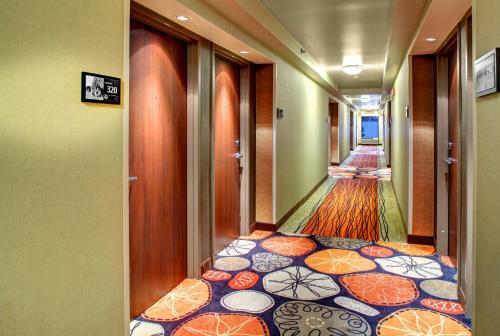 Free Wi-Fi and a coffee maker are standard amenities in every room at the Johnson City Hampton Inn. All rooms are warmly decorated with carpeted floors and include a work desk. Pine Oaks Golf Course and The Mall at Johnson City are both 3 miles from the hotel. the hotel Hampton Inn Johnson City so we can give you detailed rates for the rooms in the desired period.